The latest from the Blackberry stable, the Curve 8900, is now available on UK Vodafone and T-Mobile will have it in the US. The Curve builds on the success of previous models – some people are even declaring it a combination of Curve, Bold and Storm. With the screen from the Bold (high-res 2.4-inch 360×480), the 3.2Mpx camera from the Curve, WiFi, GPS and a very strong audio and video player, including divx playback, it’s going to be one to watch. We’re hugely excited about getting our hands on the Blackberry Curve 8900.
live interviews and live political events on it. As we’ve said before, despite having mobile handsets thrust at us from all angles, we still love the original Curve – even more so in an increasingly Twittering world. Come to us, come to us Blackberry Curve 8900. Blackberry has, over the last 18 months, proved itself as a company on the move – producing great devices and not staying still. By way of showing how seriously we take the Blackberry/RIM, we’re giving them their own category. How exciting! 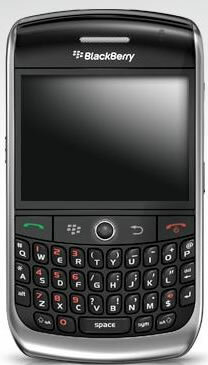 Ilove sow much the.black berry curv 8320!